Probably best known for his work at the college level with 2 stints at USC, I prefer to remember for his days with the Los Angeles Rams, Eric Dickerson, Jim Everett, and the years in which the Rams were the only challenge to the 49ers in the NFC race. A solid proponent of the ground game, Robinson is considered an offensive mastermind. He began his career shortly after he graduated from Oregon where he played end in 1958. As an assistant he’d stay with the college from 1960- 1971. In 1972 he joined John McKay at USC where Robinson served as offensive coordinator through 1974. 1975 would see Robinson reunited with his boyhood friend John Madden in the NFL at Oakland coaching runningbacks. He’d stay there one season before returning to USC to take over as head coach for recently departed McKay (who left to become head coach of the expansion Tampa Bay Buccaneers). After a successful tenure at USC and 3 Rose Bowl appearances, it did not take long for another NFL franchise to take notice of John Robinson’s accomplishments, and in 1983 the Los Angeles Rams would snag him. John turned around a disastrous 1982 franchise, and coached the team to the playoffs the following season. He’d continue to build winners, as the team would in fact make the playoffs in 4 consecutive seasons. The Rams started as an offensive ground juggernaut under Eric Dickerson, and then mutated under Jim Everett and Ernie Zampese into a pass happy machine. John would also steward the team under both the Eric Dickerson trade and the Jim Everett trade. His career record ended in the NFL at 75-68, but its a misleading number as the majority of his losses came in back to back double digit seasons at the end of his time in the NFL. In the rugged NFC West, John’s teams won 2 division franchises and qualified for the playoffs in 6 of his 9 seasons playing against the hated 49ers twice a year. His teams went to the NFC championship twice during his tenure, losing to the Bears in 1985 and the 49ers in 1989. 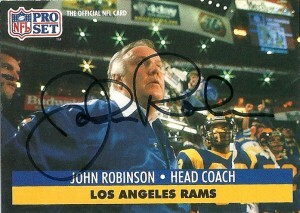 After a rough 1991, Robinson would be released from his contract with the Rams. At the time of his dismissal he had the most wins in franchise history at 79 and as of 2011, he still remains the franchise’s winningest coach. Also of note is that Robinson is 2-0 coaching in the Pro Bowl. Robinson took a year off but returned to coaching at USC in 1993. He’d turn the college program around and build a remarkable team. In his five years with USC he’d lead the Trojans back to 3 more bowl game wins. In 1999 John took over at UNLV and was quickly promoted to Athletic Director in 2002. He resigned after the 2004 season. Currently John does double duty as an occasional commentator for the Sports USA Radio Network and also as defensive coordinator for San Marcos High School. In 2009 he was named to the College football Hall of Fame. I was having a hard time getting a response from Rams initially with a failure from Greg Bell, and no response from Kevin Greene, Jerry Gray, Henry Ellard, Flipper Anderson, or Roman Pheifer for that matter- so I have been surprised that the last 3 I’ve sent for, Robert Delpino, Jim Everett, and John Robinson, have quickly responded to my requests. Once again 2 more nice cards from Pro Set here. 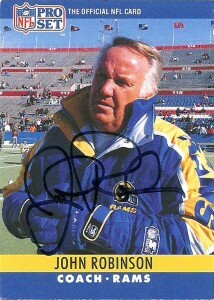 At the time they were the only card set that made head coach cards, and while the left one has John bundled up in what looks like Buffalo in a stylish starter jacket from the era I always wanted in a portrait format, the Pro Set 1991 card has him in a landscape shot- something that was considered cutting edge for the time. Many card vendors filed suit after this and it became quite en vogue for a few years afterwards. Of note the right one appears to be a night shot, and the lens required to make this beautiful photo must have been fairly expensive, however the landscape shot to me just feels like something that ProSet did for novelty sake.